« US economy slows: too much saving or too little investment? In a recent article, Joseph Stiglitz, former chief economist of the World bank, Nobel prize winner in economics and now adviser to the British Labour Party, reckons that we are in a new era of monopoly and this is a the key cause of extreme inequality of income and wealth, inefficiency and low productivity growth and general stagnation in the major economies. Stiglitz argues that the classical and neoclassical schools of economics assumed ‘competitive markets’ where all companies were on a ‘level playing field’. This meant that owners of capital received profits that matched their contribution to an increase in output, their ‘marginal product’. This rosy view is dismissed by Stiglitz. In reality, who gets what in society is dependent on ‘power’. Large companies can dictate prices in markets to small companies and can dictate wages to labour where they have no collective power (trade unions). This ‘monopoly’ (over markets for commodities and labour) is what is ruining capitalism, argues Stiglitz. Clearly, there is more than an element of truth in this perspective of capitalism. The balance of forces in the struggle between capital and labour determines the share of income created by labour between profits and wages. And it’s also true that large companies can often fix prices and market access to gain a lion’s share of sales and profits. Indeed, Marx forecast over 160 years ago that the competitive struggle for profits between capitals and recurrent crises in production would lead to greater concentration of capital in the hands of a few and the centralisation of capital in financial sectors, intimately connected to the state itself. Stiglitz cites a very recent account of market concentration in the US carried out by the US government. The report found that in most industries, according to the CEA, standard metrics show large – and in some cases, dramatic – increases in market concentration. The top 10 banks’ share of the deposit market, for example, increased from about 20% to 50% in just 30 years, from 1980 to 2010. Stiglitz concludes “today’s markets are characterised by the persistence of high monopoly profits”. Stiglitz thus calls for ‘government intervention’ to reduce the power of monopolies and presumably create an environment for more competition so that there is “efficiency and shared prosperity”. But this begs the question: is ‘competitive capitalism’ any more likely to deliver better economic growth, higher productivity from the labour force (efficiency) and less inequality than ‘monopoly capitalism’? The answer to the question is partly met by pointing out the illusion that there ever was a great ‘competitive capitalism’ that grew fast without crises and distributed incomes and wealth on a ‘fairer basis’. Capitalism became the dominant mode of production globally with all the warts of monopoly, state support and firm suppression of labour power already there. There never was a level-playing field and, globally now, despite the competitive struggle for markets, there are different levels of monopoly or imperialist power. But the other contradictory side of the answer to the question is that competition has not disappeared. Stiglitz dismisses the view of Joseph Schumpeter that monopolies are eventually undermined by new competitors with new technologies or new products and markets. Yet, as Marx showed, the development of ‘monopoly’ super-profits become an incentive for new capital to flow in (if it can break through the tariff, scale and other cartel barriers). And that happens all the time: from publishers to Amazon; from British industry in the 19th century to German and US industry in the 20th; to Chinese manufacturing in the 21st. After all, monopoly power is really oligopoly (a few large companies) and oligopoly can exhibit fierce competition, nationally and internationally. The real cause of inequality is not monopoly but the increased exploitation of labour by big capital since the 1980s in the effort to reverse falling and low profitability experienced in the 1970s. And the real cause of ‘stagnation’ and low productivity growth is not monopoly but the failure to invest, not only by large ‘monopolies’ but also by smaller capitals suffering from low profitability and high debts. In other words, it is not monopoly that is the problem per se, but the weakness of the capitalist mode of production where investment and employment is only for profit. This Stiglitz ignores. As a result, his solution of government intervention to reduce inequality and create a more ‘level playing field’ for ‘competition’ among capitalist companies is utopian (you can’t turn the capitalist clock back) and unworkable (it would not achieve greater equality or better growth). Ironically, there is another study that Stiglitz has not noticed that shows the rise in US inequality has coincided with the decline of large companies that used to employ hundreds of thousands or even millions of workers and their substitution by much smaller companies. The share of large employers in total US employment went down simultaneously with the increase in US income inequality. This study shows that is the decline in the power of labour through out-sourcing and globalisation that has driven up inequality in incomes. The ‘internal’ break-up of large company (Fordist) employment into small contractors is the key feature of Stiglitz’s world of ‘monopoly’. In other words, what workers in America need is not the break-up of monopolies to create small companies in competition but trade unions. The monopoly power that matters is that held by capital over labour. The average manufacturing production worker in Michigan earns $20.80 an hour, vs.$18.86 in South Carolina, according to data from the Bureau of Labor Statistics. Why do factory workers make more in Michigan? In a word: unions. The Midwest was, at least until recently, a bastion of union strength. Southern states, by contrast, are mostly “right-to-work” states where unions never gained a strong foothold. Private-sector unions have been shrinking , but they are stronger in the Midwest than in most other parts of the country. In Michigan, 23 percent of manufacturing production workers were union members in 2015; in South Carolina, less than 2 percent were. The power of capital over labour has produced post the Great Recession in America millions of households in permanent jeopardy of slipping into outright poverty. A Federal Reserve survey that found 47% of Americans wouldn’t be able to cover an unexpected $400 expense without borrowing or selling something. The Gallup Good Jobs Index measures the percentage of the adult population that works 30+ hours a week for a regular paycheck. It stood at 45.1%. In the US, 62.8% of the civilian noninstitutional population participates in the labor force, and 5% are unemployed, while Gallup tells us only 45.1% have what it considers a “good job.” These aren’t directly comparable datasets, but a rough estimate suggests that maybe a fifth of the labor force is either unemployed or have less-than-good jobs. People who lose jobs in a recession experience a variety of long-lasting effects. Their new jobs often pay them lower wages, and it takes years for them to reach their previous earnings peak. These people are less likely to own a home; they experience more psychological problems; and their children perform worse in school. This is called ‘wage scarring’. About 40 million Americans lost their jobs in the 2007–2009 recession. Only about one in four displaced workers have got back to pre-layoff earning levels after five years, according to University of California, Los Angeles economist Till von Wachter. A pay gap persists, even decades later, between workers who experienced a period of unemployment and similar workers who avoided a layoff. 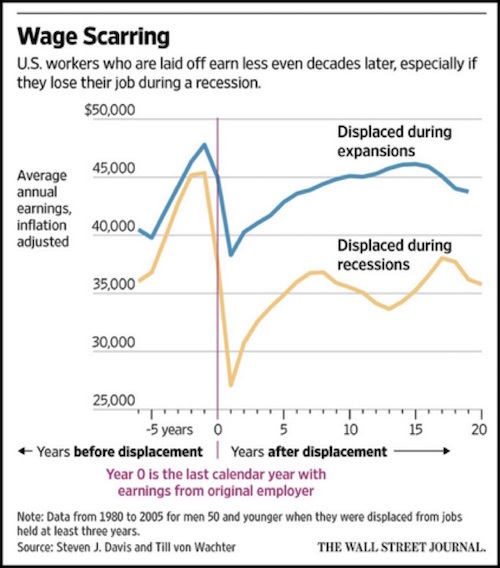 People who lost a job during recessions made 15-20% less than their nondisplaced peers after 10 to 20 years. And these people will reach retirement age with little or no savings. They will either keep working or they will live frugally. The April jobs report showed a staggering 16% unemployment rate for teenagers ages 16–19. This sample includes only those who were actively looking for jobs, so these aren’t full-time students. They have either dropped out, or they want to work while in school. 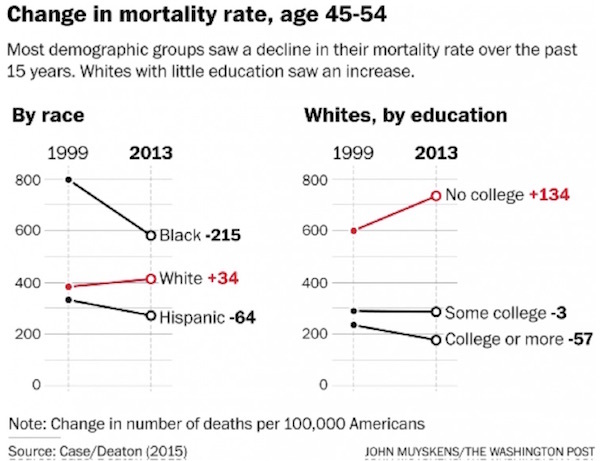 And there is the surprisingly higher death rate among middle-aged whites in America. That rate is the direct result of increased suicides and abuse of drugs and alcohol – all part of the psychological depression process. Over the past decade, Hispanic people have been dying at a slower rate. Black people have been dying at a slower rate; white people in other countries have been dying at a slower rate. Yes, monopoly (more accurately oligopoly) power has increased in the last 150 years since Marx forecast that the capitalist mode of production would lead to increased concentration and centralisation of capital. And that shows that capitalism is in its late stage of development and so must be replaced by ‘social monopoly’. But that also means that a return to competition by government regulation, as Stiglitz implies, would not work; either to renew the power of capitalist development or to reduce inequality. The permanent damage to millions of people’s lives in America, one of the richest capitalist economies in the world and the ‘land of the free’ is not the result of monopoly, but of the failure of capitalism to deliver enough things and services that people need, affordably. Yes, the rich elite sit atop their huge companies and banks ‘earning’ massive salaries and bonuses and hedge fund managers and bankers reap big capital gains. But the vast majority of Americans are struggling to make ends meet precisely because of ‘competitive capitalism’ and its failures. This entry was posted on May 17, 2016 at 9:07 am and is filed under capitalism, economics, marxism, Profitability. You can follow any responses to this entry through the RSS 2.0 feed. You can leave a response, or trackback from your own site. The price of beef may be high or low, but it always involves the same sacrifice for the ox– I believe that’s the way Marx put it. In 1908 Jack London wrote the Iron Heel and in it he mocked those who wanted a more competitive capitalism as the new luddites. Now more then a hundred years later, not so new. The top 2000 global corporations (Forbes) produce one third of global revenue (gross output) between them and are three times more productive (gross output per worker) than workers in the developed capitalist countries. It is easier to expropriate a few thousand large international corporation to build socialism than millions of smaller companies. Also, while big may not be beautiful it is bountiful. Without the productive potential of these large corporations the future cannot be built. And none of those 2000 “monopolies” are exempt from the law of value. The distinction between “competitive capitalism” and “monopoly capitalism” is literally meaningless. Sartesian is correct. Competition has to be seen at an international level and the law of value still operates. In the last 20 years their has been the most rapid churn of corporations in living memory. I have detailed this in my posting on state capitalism. The real question is this. Now that the long wave of expansion is over, now that capitalism in on the verge of slumping, will that churn be arrested as centralisation takes over from concentration and will we witness the expropriation of capitalist by capitalist on an international level. Its always on the verge of slumping. The problem is – is it this verge or the next one? I don’t know, Bill. I do know why capitalism does what it does; I do know what makes what it does so necessary to its reproduction; but I can’t tell you when it’s going to do it. But really, being almost right in that one doesn’t make up for being so painfully wrong in the other great prediction of 2004– that there was no way the Boston Red Sox would come back from an 0-3 deficit to take 4 straight from the Yankees, and knock the Yankees out of the World Series. I’m still in complete denial about that one. Somewhere I remember reading Marx as saying that capitalism tends toward really large companies, beyond the point at which they are efficient. I.e. Capitalism is bad at creating organisations of optimum size. Don’t ask me how you measure optimum size! So I think Marx recognized this as an actual deficiency of capitalism. The assumption here is that under planned socialism firms would be cut down (or up) to the appropriate size. Given the recent discussion re Anwar Shaikh I am surprised the idea of ‘real competition’ isn’t raised in this post. Yes, such as aircraft or mobile phones. Profit creates competition, not vice versa. Also, the ‘monopoly capital’ idea of price manipulation is overdone.